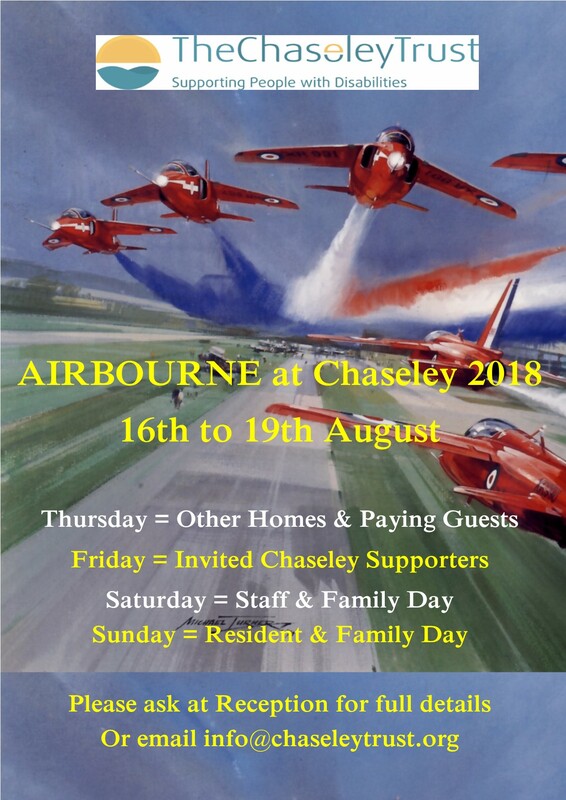 Help us to raise much needed extra monies for the Charity to support our Residents, by enjoying Airbourne at The Chaseley Trust. Over the four days we will dedicate each day as an opportunity to celebrate and thank specific groups. On Thursday we will invite a selection of other Homes, thank our Volunteers. On Friday we will thank our Chaseley Supporters and local contacts and on Saturday we thank our Staff by holding a Staff and Family Day. Sunday is our day dedicated for Residents and their families to enjoy watching the spectacular Airshow in our relaxing sea front Gardens and have a BBQ lunch with their families. Thursday 16th August £15 – Price includes a Ploughmans lunch and glass of wine or soft drink. Friday 17th August £25 – Price includes a two course buffet lunch and a glass of wine or soft drink. Or if you are the family or friend of a Resident, you can enjoy Residents Airbourne Day on Sunday 19th August 2018 and have a BBQ lunch for £5 Adults or £2 Children. Prior booking is essential, so please email info@chaseleytrust.org for tickets or more information or pop into the Chaseley’s Reception.